Our services are designed to support your every day work in practice whilst keeping you up to date with the latest clinical research and are available to all our users. 'Library services price list' and relevant request forms are available to download from the 'Related documents' box. 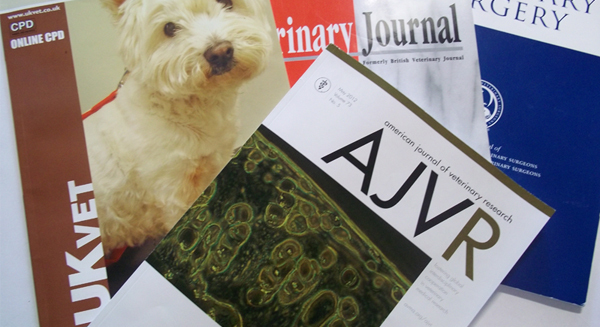 Our core membership package gives you off-site access to a wide range of full text electronic journals, and allows you to do your own literature searches on the world's largest veterinary medicine bibliographic database. For more information on member benefits and how to join. We can send you photocopies from journals, conference proceedings, reports and books, subject to copyright law, for private study or research. Just complete a copyright declaration form with details of your request and return it to us. We will then send the photocopy to you by post or fax. Requests are normally processed within two working days; and urgent requests within a couple of hours. If we don’t have the material you need in our Library, we will try and obtain it for you from another library via our interlibrary loan service. Please complete this Copyright declaration form to request an article. If your request is for a commercial purpose, an additional copyright fee is applied. Please complete online form. If you are short of time or having difficulty finding information we can carry out a literature search for you. We will then send you a list of references. The search will normally be completed within 5 working days. Please complete this literature search request form. If you can’t come into the Library, we can send materials to you by post. Books can be borrowed for four weeks. They can then be renewed a further two times if no one else is waiting for them. To help you keep up-to-date with the latest information we can supply quarterly alerts in a range of subjects such as veterinary dentistry and veterinary cardiology. Alerts are sent out in January, April, July and October and contain details of all the articles published in the previous three months. For more information or if you would like to sign up for this service, please click here. The LIS team has introduced a new way of keeping up to date with the latest evidence; inFOCUS watches all relevant veterinary journals to provide you with concise summaries of the most important, interesting or practice-critical primary and secondary material. Subscribe to have the latest inFOCUS updates sent directly to your inbox in a bi-monthly email containing the summaries - including the bottom line for implementation in practice - plus the option to read the original articles. On a bi-monthly basis we choose a topic to be in the Spotlight where we gather articles, information sources and references retrieved from CABAbstracts database that you may find useful. A workshop for beginners and those with intermediate skills, covering database searching and accessing online resources including electronic journals, focusing on the resources offered by the RCVS Knowledge Library.